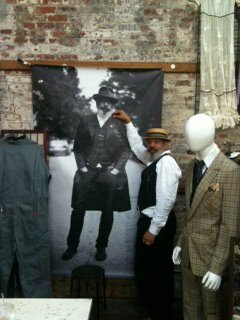 Please mark your calendars. . .Ignacio is prepping for our inaugural outing at the Manhattan Vintage Show on Friday and Saturday February 3 and 4. 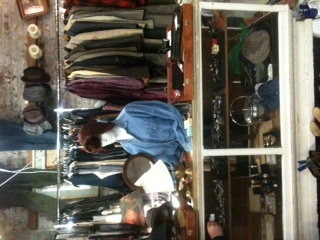 In November he visited Manhattan Vintage’s first men’s show and was truly inspired. Now the time has come for the Winter/Spring 2012 show. . .and we’ll be there with a curated collection of menswear and an assortment of women’s accessories. Plus it wouldn’t be an event without a few truly special pieces such as an amazing 1970’s Giorgio Sant’ Angelo metallic and green silk evening gown we’ve been holding onto for just the right audience. If you’re a vintage lover and never attended a Manhattan Vintage Show before, you must put it on the top of your to do list. It’s an invitation only show that gives you one stop access to 90 top dealers all under one roof. We’re so proud to be part of New York City’s premier vintage clothing shopping event! In the meantime Ignacio will be in Williamsburg at Artists & Fleas this weekend. . .and would love to see you there as well! “What does it mean to have real style? To live in as well as communicate a look that truly defines you? At QP & Monty we believe developing your signature style should be a wonderful journey. And we’re here to accompany you. We specialize in curating and creating vintage and vintage-inspired pieces that impart the wearer with elegance and panache. That hearken back to a time when dressing well was practically mandatory. When you chose what you wore not just for you, but also to be seen and admired. Whether you are looking for single piece or an entire outfit, a vintage vest or a fedora, a pocket square or cufflinks, Sartorial Pairings, aka Ignacio Quiles, can help you build a personal style based on pieces that inspire you, suit you and flatter you. If this philosophy resonates with you, you will enjoy Ignacio’s upcoming Skillshare class at Wix Lounge. For just $10 you’ll learn all about shirt and tie maintenance and you’ll receive a free vintage tie bar!! If you can’t make it to the class be sure to check out wixlounge.com to learn about their free co-working space near Union Square and if you are looking for an easy-to-use website builder wix.com can’t be beat!